Extinction Offers New Video Showcasing Skills and Strategies | Nerd Much? Let's see how you'll be ravaging those Ravenii. Iron Galaxy Studios, the folks that helped to bring us a great port of The Elder Scrolls V: Skyrim, have their own IP they plan to bring us next year. It’s entitled Extinction, and despite flying relatively under the radar, it looks pretty good. The game revolves around the massive Ravenii and their threat to the kingdom of Dolorum. 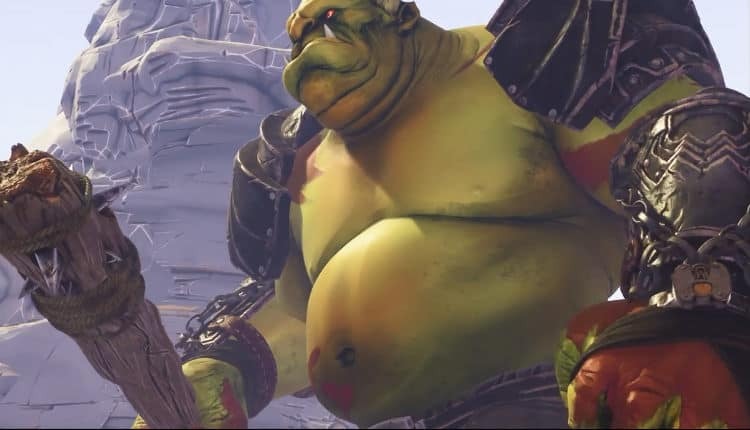 The Ravenii are essentially huge ogres that are dead set on forcing humanity into – you guessed it – extinction. Our main character within the 3rd person action adventure is known as Avil. Using his array of powers, Avil is tasked with transporting civilians to safety during Ravenii attacks. However, he also needs to slay the ogres and their minions before the situation gets out of control. Most of the ogres you’ll face off against feature specialty armor carrying their own characteristics. But they also bring unique weaknesses. Utilizing Avil’s upgraded skill tree, he’ll eventually have solutions to make each Ravenii armor set more vulnerable. Featured in today’s Skills & Strategy video above are Avil’s approach to said situations. For instance, should a Ravenii be using Gold armor, you’ll notice that the armor has grapping points throughout. Avil can utilize his Grapple Whip to quickly navigate across the great beast’s body, attacking weak points as he flies around too quickly to be in danger. If a Ravenii should be equipped with Iron armor, you’ll see giant locks keeping his armor in place. Avil can then aim his Rune Strike ability at the locks to weaken the ogre’s armor, before eventually removing it from its body and making it vulnerable to attack. If an ogre has the Bone armor, it sports a magical flame barrier that prevents its destruction. To conquer this, Avil must use his Rune Slowdown ability in order to avoid the flames and get damage done to the Bone armor. There’s also untouchable Spiked armor ogres. Using Rune Gravity, Avil can more precisely land on “safe” spots atop the ogre, avoiding the spiked armor. There is also an ultimate form of Ravenii armor known as Bright Steel armor which is impossible for Avil to destroy. This makes some of the ogres in-game extremely hard to kill. And sometimes you must instead complete your mission without taking them out. But should you be insistent on slaying it, you can upgrade Avil’s various traversal skills too, making it easier to approach and take down the given foe. You can see all of this in the video above, so watch it for yourself to get a feel for the game. Iron Galaxy and Maximum Games haven’t announced a release date yet for Extinction. They’ve only cited a Spring 2018 release window. It’ll be the typical $59.99 price point on PC, PlayStation 4 and Xbox One. However, and perhaps indicative of the times, Extinction’s clip from today starts off with glaring text stating that “Extinction does not include micro-transactions.” So at least we won’t have to worry about that while avoiding deadly ogres.